Rory McIlroy of Northern Ireland earned an invitation back to Bermuda for the PGA Grand Slam of Golf when he won his third Major at The Open Championship. 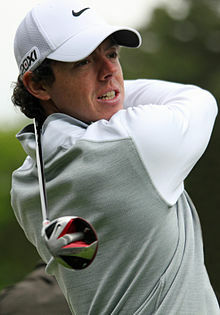 McIlroy, now 25, played in the Port Royal Golf Course season-ending tournament in 2011 after winning the U.S. Open. Only Majors Champions are invited to participate in the Grand Slam. It’s the most difficult tournament in the world for which to qualify. “In the Grand Slam’s 32 year history, the only other player to qualify for the Grand Slam this many times at such a young age is Tiger Woods,” said David Charles, Senior Director of Championships for the PGA of America. American Bubba Watson [Masters] and German Martin Kaymer [U.S. Open] have also qualified for the 2014 PGA Grand Slam of Golf and both two-time Majors Champions have played in Bermuda previously – 2012 and 2010 respectively. The PGA Grand Slam of Golf features the winners of the year’s four Majors – the U.S. Open, the Open Championship, the PGA Championship and The Masters. The final qualifier will be decided next month in Louisville, Kentucky at Valhalla Golf Course and the PGA Championship. Great news. Now that Tiger hasn’t won in 25 majors and might as well be on the seniors tour, Rory is the man. Scott and Rose maybe too? Arguably the 2 best others in the world right now.